India's $50 Tablet, Sakshat - now Aakash - launched! Over the last few years we have seen innovation in the field of tech in Indian market that includes both surprises as well as shocking facilities as well as news. Smartphones and Tablets are the modern India new trends in connectivity and providing better facilities to its masses. While the latest news includes from India which has set to launch an ultra-low cost tablet which is going to be available at a cost of $50 aims on providing better connectivity to the entire country masses. The Tablet earlier called Sakshat, now named as Aakash (which means the Sky), is a high profile government project which has been implemented with innovative features. However the project was scheduled to be launched much before, but maybe because of some administrative issues the project was delayed a bit. As far as what we have got to know, the Akash Tablet is going to be made available for $50, while for students its just going to be $35. Apart from the rubberized finish, you’d think the device was redesigned from the ground up. The final unit has lost all the connectivity options its prototype counterpart offered. The only similarity is the 7-inch resistive touchscreen. There is just one face button, which is essentially the home button. That’s it. No menu, volume rocker or back button. Press and hold the home button and you have the menu option. In terms of connectivity, the device has support for two full sized USB ports and a micro SD card slot along with a headphone jack and the DC in port. The only similarity is the OS. The prototype ran on android 2.1 and the final version runs on 2.2. The video out has been removed. We were given no under the hood hardware specs for the prototype we do have them for the final build. It has a 366MHz processor with a dedicated HD video processor and 2GB on board flash storage. The device has the capability to play full HD videos at 1080p. We saw a few HD YouTube videos on the device and they ran absolutely smoothly, without any hiccups. The battery on the other hand is a bit underwhelming. The ministry claims that at 2100mAh, the device will last for about 1.5 to 2 hours if used to watch videos. If used averagely, the device will last for about 3 hours. That’s a short span as the device wouldn’t last an entire school day and students will need to visit a charging station every two hours. The India HRD ministry states that the manufacturing cost of the device is not $35 as was earlier announced, but $37.98. The sales price of the device however is $49.98 after adding the transportation cost, warranty and other costs. The manufacturer will be able to deliver 1,00,000 units of the device to consumers at $49.98 that is approximately Rs. 2276. 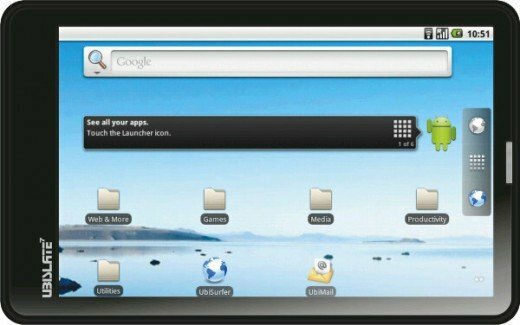 The tablet Aakash has been developed by UK-based company DataWind and Indian Institute of Technology, Rajasthan. AFP has confirmed that there will be initially 500 tablet devices which will be given to students with the help of Government of India. Along with that Datawind, the Device Manufacturer will produce 700 units per day. The project Akash is going to be the toughest challenge for the rest of the distributors of Tablet in the Indian market along with Hong Kong-based iberry who is going to release tablet for $140 and Beetel for another $180. The tablet is going to be a 7 inch capacitive screen which will come along with 366MHz processor for better procession capabilities for a dedicated HD video processor. The Connectivity options includes 2 full-sized USB ports which will be accompanied with a microSD card slot for perfect data transfer facility for both inbound as well as outbound transfer. Along with that, there are news for some WiFi so that people might connect with Internet where ever they are. For Entertainment, the tablet is accompanied with video processor capabilities that comes with 1080p HD YouTube videos enhancement. The battery is going to be 2,100 mAh with which you can watch 5-12 hours of video watching and 3 hours during its regular use. The Operating System is going to be Android 2.2 which will provide good support. Here is the comparison chart of Aakash vis-a-vis other tablets available, courtesy NDTV. In all the cases, this is going to be the perfect and cheapest tablet of all till now. Many were very skeptical about this tablet becaming a reality, since it was first announced, but as can be seen – Aakash – earlier called Sakshat – has become a reality! Iwant to buy this Aakash Tablet and don’t know from where I will buy can some one please infrom me where this is available in kolkata market. how to get this tablet …plz tel if any one has idea? Yup, it will be available in nov with the help of government policy..
What does the scam has to do with the delay in project? I think if any delay is there, its due to if I remember correctly HCL withdrew from the project and last year the minister has promised to bring it within a year showing the prototype and he has done that. I’m not sure about the delay due to scam thing. When was it scheduled to be launched?